We all have the longing for a deeper experience of love. This is part of our human nature to desire to connect in a truly intimate way with another. Guidance helps, and this being the week of Valentine’s Day, I would like to share some wisdom and heart‑centered steps for developing intimacy in love: The Story of the Beloved, the Shekinah Presence, The Four Steps to Creating Divine Romance with a Partner (and that partner can be God), and a Return to Bliss. In a new relationship, there are things that you can do to help foster the experience of your beloved. If you are in a long‑term relationship there are steps you can take to re‑kindle your love by calling in the presence of the Beloved in both you and your partner. If you don’t have a partner, there are spiritual practices you can use to call in your beloved while in meditation. 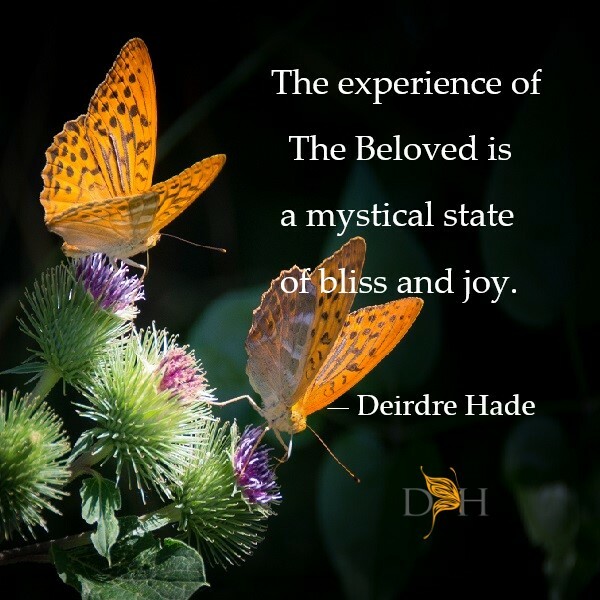 The experience of The Beloved is a mystical state of bliss and joy. In the Kabbalah, it is said that there is a soulmate for every person on Earth. Everybody has a soulmate, but sometimes we don’t find each other because we can’t hear our soulmate calling for us. It is therefore important to open your spiritual eyes and ears and be ready to know when the energy of your soulmate is near. You want to be aware enough to recognize this presence of love. And what if you don’t have a partner and you desire one? Your loving partner is coming. Believe and know this. God created someone for everyone! On Valentine’s Day I will be sending you my “Prayer to the Beloved” to call in your Beloved.